Join the Inferno Discussion Group and Mailing List. 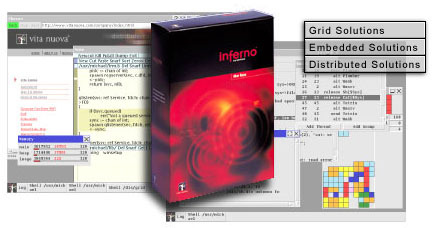 What is the Inferno® OS? Inferno® is a registered trademark of Vita Nuova Holdings Limited in the USA and other countries, and in the European Union. Inferno OS™ is a trademark of Vita Nuova Holdings Limited in the USA and other countries, and in the European Union. Limbo® is a registered trademark of Vita Nuova Holdings Limited in the USA and other countries, and in the European Union. Dis® is a registered trademark of Vita Nuova Holdings Limited in the United Kingdom, the USA and other countries.